If you love meat, be it fish, pork, poultry, lamb, or beef, then you know how disgusting it can be to eat overcooked or undercooked meat. Such meat doesn’t taste good, and it is never satisfying, which is the reason you need to purchase a meat thermometer. With such a thermometer, you can monitor the oven and meat temperature even in the comfort of your chair or the company of friends. Owing to these benefits and so much more, we will have a look at the top 10 best wireless meat thermometers. These are easy to use while they offer a long distance range to allow you to monitor the progress of the cooking meat from a distance. Have a look so that you can determine if there is a thermometer that is suitable for you. Entertain your friends while preparing a meal with Inkbird IRF-2S 1000 meat thermometer. The thermometer offers a super strong wireless signal range up to 1000feet and a stable ability through the wall so that you can control its operation from a long range. Also, it features two probe sockets with dual probes so that you can monitor the temperature of the meat and oven. The thermometer allows you to read in Fahrenheit or Celsius where its probe temperature range is 32F~572F (0℃~300℃). With it, you can set the desired temperature value since it can save the preset temperature and sound an alarm when the temperature reaches. The thermometer is suitable for use in an outdoor environment and even at night since it features a backlit LCD screen. 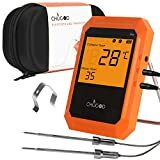 Nothing’s better than cooking while within the company of friends, the reason this is one of the best wireless meat thermometers in this review. With it, you do not have to excuse yourself from the company of friends so that you can check your meat since it offers a wireless remote control range of up to 300 feet away. Better yet, the thermometer has a count-up and countdown timer that lets you cook without worrying about overcooking the timed vegetables. You can get the thermometer with an assurance that it is safe to use since it features a 6.5″ food-grade stainless steel probe. The probe features a step-down tip design that allows it to receive the temperature accurately and quickly for faster and better cooking results. Another benefit of the thermometer is that it features a smart LCD that displays three different colors based on how far the meat is cooked. Also, it includes preprogrammed temperatures which you can change to suit your taste and preference. 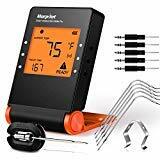 A simple but effective way to monitor cooking food is by adding Morpilot wireless meat BBQ thermometer into your cooking. It comes with five shape probes and an upgraded probe that enables you to monitor up to six different types of food. Once each probe reaches the desired temperature, it sends this to the LCD of the thermometer while you hear an alarm that tells you that the food is ready to eat. You can use the thermometer while at 160 feet away since it is Bluetooth compatible to allow you to connect it to your smartphone via the Smart BBQ Meter app from your App Store. Watch TV or play games while cooking with this wireless meat thermometer. It adopts a signal transmission range of up to 230feet so that you can engage in extra duties without having to worry about overcooking your food. 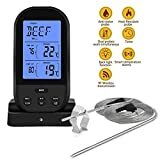 What’s more, the thermometer features eight food program modes and five tastes so that you can cook a variety of meats using the preset temperatures. The step-down tip design is another feature that makes the thermometer worth since it can display the temperatures faster and accurately. You can be sure to have an easy time when using this thermometer since all you need to do is to insert the probe into the food, set the target temperatures, and wait for the alarm to beep when this temperature is reached. The thermometer comes with one stainless steel food probe and one oven probe. The probe and wire can withstand a 716°F (380°C) temperature. Monitor two types of meat in different locations with this meat thermometer. The thermometer features dual probes that allow you to monitor two foods at a time. Apart from that, it features presets of nine types of meat including pork, chicken, beef, and fish, and five types of desired tastes so that you can cook food to deliver the desired taste. Once you get this thermometer, you can monitor the food while away due to the signal transmission range of up to 300feet. Also, you can monitor the food while in a low-light condition since the transmitter and receiver feature backlit LCDs. The thermometer is a perfect choice when you want to eliminate overcooked or undercooked food since it features a count-up and countdown timer. Its probe can withstand a temperature that ranges from 32°F – 572°F while the probe wire features a heat-resistant design to allow you to use it with hot food. Monitor up to six foods simultaneously with this meat thermometer. It adopts a 6-channel technology that enables it to support up to six probes. The thermometer comes with two stainless steel BBQ thermometer probes. The probes feature a high heat resistant flame-proof grip to allow you to read the temperatures faster and accurately. 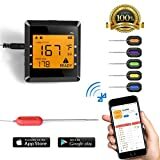 You can use the thermometer to monitor food while 164 feet away due to its Bluetooth compatibility and the advanced technology that provides a powerful and reliable performance. 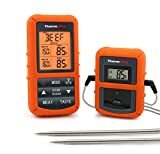 Also, the thermometer is a perfect choice for use with a variety of food since it features preset temperatures for 11 types of meat so that you will never worry about overcooking or undercooking. 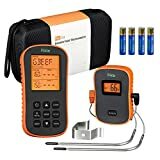 An all-purpose meat thermometer that serves as one of the best wireless meat thermometers is Tenergy Solis Food Thermometer. It is capable of reading temperatures that range from 32°F – 572°F allowing you to use it with a variety of foods. The thermometer features a large and beautifully-designed backlit LCD that allows you to read the temperatures even during the night. Once you get it, you can forget about the need to stand around a cooking meal so that you can monitor its progress. The reason is its ability to allow you to connect it to an app on your phone so that you can receive instant notifications while standing at a range of up to 100feet. You can be sure to have an easy time when using this thermometer since it adopts 11 pre-set temperature settings that let you customize them based on your preference. Also, the thermometer allows you to monitor up to six types of food at a time since it includes 6-channel stainless steel probes. 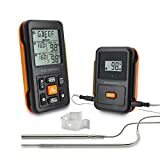 Monitor your meat and oven temperature remotely while you are 300 feet away with this dual probe digital wireless thermometer. 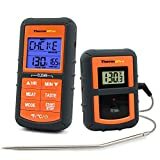 The thermometer comes with a 3″ oven probe and a 6.5″ food-grade stainless steel temperature probe so that you can take temperatures fast and precisely. More to that is a pre-synchronized digital thermometer receiver and transmitter so that you can be sure to receive a unit that is ready to use. The thermometer is a perfect choice when you want to avoid overcooked or undercooked food since it is equipped with a timer and an alarm that make monitoring the meat and oven temperatures easy. Also, the receiver flashes when the temperature goes above or below the set range meaning that you can be sure to get the perfect results. You can use the thermometer with temperatures ranging from 32°F to 572°F (0°C to 300°C). 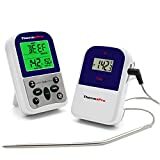 A thermometer that will serve as a perfect choice for cooking ground beef, chicken, pork, lamb, and fish is ThermoPro TP-07 thermometer. With it, you can monitor your food while 300 feet away so that you can avoid the trips of going back and forth to check your meat. Also, you cook a wide range of recipes since it can monitor foods that cook at a 32°F to 572°F (0°C to 300°C) temperature. The thermometer includes a smart LCD backlit screen that displays three colors based on the temperature level to allow you to have an easy time while using it. You can expect to receive a 6.5″ food-grade stainless-steel probe that features a 40″ reinforced stainless steel mesh cable alongside the thermometer. What’s more is a pre-synchronized transmitter and receiver so that you can use the thermometer as soon as it arrives. The thermometer includes a countdown and count-up timer and an alarm that notifies you as soon as the preset temperature is reached. Taking the lead in this review is TP20 Wireless Thermometer. It comes with dual probes where one monitors the oven temperature while the other monitors the food temperature. On top of that is a pre-synchronized transmitter and receiver so that you can use the thermometer right out of the box. You can use the thermometer while 300 feet away thanks to the long transmission distance. With it, you can prepare nine types of meat easily and conveniently since it features pre-set temperatures for them. Also, it features a large backlit LCD that displays the food and oven temperature even in low-light conditions. There is no reason why you should let your meat to overcook or undercook with the availability of the best meat thermometer. 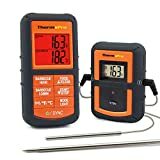 Therefore, get one of the thermometers so that you can monitor the progress of the cooking meat without having to leave the company of your friends.